In this tutorial, we will understand an important concept called “Selective Search” in Object Detection. We will also share OpenCV code in C++ and Python. An object recognition algorithm identifies which objects are present in an image. It takes the entire image as an input and outputs class labels and class probabilities of objects present in that image. For example, a class label could be “dog” and the associated class probability could be 97%. On the other hand, an object detection algorithm not only tells you which objects are present in the image, it also outputs bounding boxes (x, y, width, height) to indicate the location of the objects inside the image. At the heart of all object detection algorithms is an object recognition algorithm. Suppose we trained an object recognition model which identifies dogs in image patches. This model will tell whether an image has a dog in it or not. It does not tell where the object is located. To localize the object, we have to select sub-regions (patches) of the image and then apply the object recognition algorithm to these image patches. The location of the objects is given by the location of the image patches where the class probability returned by the object recognition algorithm is high. The most straightforward way to generate smaller sub-regions (patches) is called the Sliding Window approach. However, the sliding window approach has several limitations. These limitations are overcome by a class of algorithms called the “Region Proposal” algorithms. Selective Search is one of the most popular Region Proposal algorithms. In the sliding window approach, we slide a box or window over an image to select a patch and classify each image patch covered by the window using the object recognition model. It is an exhaustive search for objects over the entire image. Not only do we need to search all possible locations in the image, we have to search at different scales. This is because object recognition models are generally trained at a specific scale (or range of scales). This results into classifying tens of thousands of image patches. The problem doesn’t end here. Sliding window approach is good for fixed aspect ratio objects such as faces or pedestrians. Images are 2D projections of 3D objects. Object features such as aspect ratio and shape vary significantly based on the angle at which image is taken. The sliding window approach because computationally very expensive when we search for multiple aspect ratios. The problems we have discussed so far can be solved using region proposal algorithms. These methods take an image as the input and output bounding boxes corresponding to all patches in an image that are most likely to be objects. These region proposals can be noisy, overlapping and may not contain the object perfectly but amongst these region proposals, there will be a proposal which will be very close to the actual object in the image. We can then classify these proposals using the object recognition model. The region proposals with the high probability scores are locations of the object. Region proposal algorithms identify prospective objects in an image using segmentation. In segmentation, we group adjacent regions which are similar to each other based on some criteria such as color, texture etc. Unlike the sliding window approach where we are looking for the object at all pixel locations and at all scales, region proposal algorithm work by grouping pixels into a smaller number of segments. 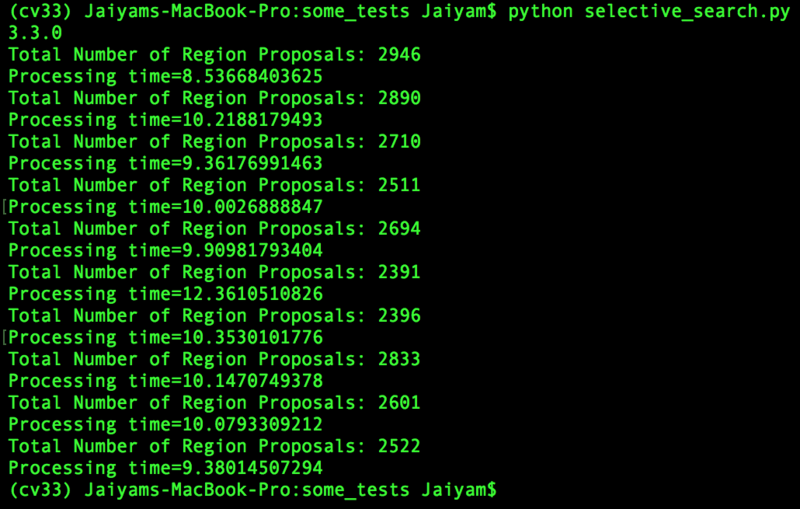 So the final number of proposals generated are many times less than sliding window approach. This reduces the number of image patches we have to classify. These generated region proposals are of different scales and aspect ratios. An important property of a region proposal method is to have a very high recall. This is just a fancy way of saying that the regions that contain the objects we are looking have to be in our list of region proposals. To accomplish this our list of region proposals may end up having a lot of regions that do not contain any object. In other words, it is ok for the region proposal algorithm to produce a lot of false positives so long as it catches all the true positives. Most of these false positives will be rejected by object recognition algorithm. The time it takes to do the detection goes up when we have more false positives and the accuracy is affected slightly. But having a high recall is still a good idea because the alternative of missing the regions containing the actual objects severely impacts the detection rate. Amongst all these region proposal methods Selective Search is most commonly used because it is fast and has a very high recall. Selective Search is a region proposal algorithm used in object detection. It is designed to be fast with a very high recall. It is based on computing hierarchical grouping of similar regions based on color, texture, size and shape compatibility. Selective Search starts by over-segmenting the image based on intensity of the pixels using a graph-based segmentation method by Felzenszwalb and Huttenlocher. The output of the algorithm is shown below. The image on the right contains segmented regions represented using solid colors. If we try to address the first problem by further merging the adjacent regions similar to each other we will end up with one segmented region covering two objects. Perfect segmentation is not our goal here. We just want to predict many region proposals such that some of them should have very high overlap with actual objects. Selective search uses oversegments from Felzenszwalb and Huttenlocher’s method as an initial seed. An oversegmented image looks like this. At each iteration, larger segments are formed and added to the list of region proposals. Hence we create region proposals from smaller segments to larger segments in a bottom-up approach. This is what we mean by computing “hierarchical” segmentations using Felzenszwalb and Huttenlocher’s oversegments. This image shows the initial, middle and last step of the hierarchical segmentation process. Let’s dive deeper into how do we calculate the similarity between two regions. Selective Search uses 4 similarity measures based on color, texture, size and shape compatibility. A color histogram of 25 bins is calculated for each channel of the image and histograms for all channels are concatenated to obtain a color descriptor resulting into a 25×3 = 75-dimensional color descriptor. Texture features are calculated by extracting Gaussian derivatives at 8 orientations for each channel. For each orientation and for each color channel, a 10-bin histogram is computed resulting into a 10x8x3 = 240-dimensional feature descriptor. Texture similarity of two regions is also calculated using histogram intersections. where is size of image in pixels. Shape compatibility measures how well two regions ( and ) fit into each other. If fits into we would like to merge them in order to fill gaps and if they are not even touching each other they should not be merged. where is a bounding box around and . The final similarity between two regions is defined as a linear combination of aforementioned 4 similarities. where and are two regions or segments in the image and denotes if the similarity measure is used or not. Selective Search implementation in OpenCV gives thousands of region proposals arranged in decreasing order of objectness. For clarity, we are sharing results with top 200-250 boxes drawn over the image. In general 1000-1200 proposals are good enough to get all the correct region proposals. Let’s take a look on how can we use Selective Search based segmentation implemented in OpenCV. The code below is a C++ tutorial for Selective Search using OpenCV. Please read through the comments to understand the code. The code below is a Python tutorial for Selective Search using OpenCV 3.3. Note the bug alert for OpenCV 3.2 mentioned after the code block. Please read through the comments to understand the code. Use "l" to display less rects, 'm' to display more rects, "q" to quit. Bug Alert: There was a bug in Python bindings of Selective Search which was fixed in this commit. So the Python code will work for OpenCV 3.3.0 but not for OpenCV 3.2.0. If you don’t want to compile OpenCV 3.3.0 and have the build folder for OpenCV 3.2.0 which you compiled earlier, you can fix this bug too. Now recompile your OpenCV 3.2.0 again. If you have a build folder in which OpenCV was compiled earlier, running the make command will just compile this module. Hi Walid, You need to compile the OpenCV with opencv_contrib. Try the updated code. It runs much faster than earlier one. How do u get image of false positive and true positive of the dog image? In dog’s image true positive and false positive is not inferred using code. Consider this to be ground truth data. You will have to run a classifier on region proposals generated by selective search to know which one is a true positive. what type of classifier did you use to create that image(false&true positive? Boxes on that image were drawn manually just to show that out of many region proposals few are correct boxes and rest are not. But I think your question is what kind of classifier we can use with region proposal methods. The original paper used an SVM with hard negative mining. Read the paper to know about the pipeline (selective search + SVM). Implementation of Haar Cascades in OpenCV is limited to a fixed aspect ratio classifier. Moreover it is also limited to detecting objects in a small scale window. So when we compare both these techniques under the assumption that we want to achieve similar results. So comparing runtime OpenCV’s Haar Cascades to selective search would be a bit unfair. Haar Cascades based pedestrian detection in OpenCV performs poorly whereas selective search was used in top 2 winning entries in ImageNet 2013. There are a few ways to speed-up selective search though. 1. Use threading. Add these 2 lines to your C++ code. Unless you are looking for very small objects there is no need to run selective search on an image with a 720p or 1080p resolution. When I scale down an image’s height to 200, selective search’s fast version runs within a second. Thanks for pointing out the speed issue though. I’ll also update the article with the changes I suggested in this comment. one can decide not to use threading because either one does not has many cores, or one wants to be able to control other processes (some old Rapsberry Pis have only one core). On nanoPi (less fast than RPi, but cheaper), with little RAM, I can detect using OCV 2 fiaces , akaze points if images are downsized (say 320*320, without seeing degradation). A sliding window, with fixed size, would involve (I say size of the window is 20 pixels and does not vary…) 90 000 tests nd I understood it was too huge. A selective search would be, with the same detection algorithm, 90 times faster (and, if one knows the size of the bounding box, may the rage of scales to be swept is smaller) …. This makes your article and the links very intersting for small nanocomputers … but I have to download and try to install opencvcontrib…. Hi, there! I’m working in a project with hand’s signal recognition using Haar Cascades, unfortunately, it’s generating some issues, like false positives, when the signal is similar. I have searched about HOG and SVM, but i didn’t find any tutorial step by step for Python. I’m begginer in this area… someone can help me with this or give me tips about other algorithm? I had some difficulties with this tutorial when i read it… Like: i’m using thousands of images, how do i do my dataset? Do i have to create a loop? Where do i put my results? Or is there one “HOG value” for each image? I’ll try again with this, thank you! Hey! Thanks so much for this tutorial. I struggled last semester trying to do that! Do you have a docker image that run this code in python? If not, would you mind creating one? Best regards!!! What is the command to run the code for python? how can i get the co-ordinates of the proposed boxes in this…??? i need the co-ordinates to feed the proposed areas to a CNN. Hello, Thanks for such a great post. My question is, how I can use the selective search for segmentation only? I want to use segmentation done by selective search for segmenting my test data images with segmented regions represented as polygons in python. For segmentation, you can use the method Selective Search uses. You can access it here – http://cs.brown.edu/people/pfelzens/segment/. do you know what makes this problem? I install python 3.6.3 and opencv 3.3 in windows enviroment. The OpenCV installed on your machine doesn’t have contrib modules. Use pip install opencv-contrib-python to install OpenCV with contrib modules. Thank you for this deep and clean explaination. Thanks for the kind words Mahir. Where do I find the .h and .cpp files needed to build the example? My copy of OpenCV for C++ does not come with the headers/code needed to use SelectiveSearchSegmentation. I am using CNTK library. Currently the time taken for ROI computation on 960×720 image is 4mins on CPU. I would like to bring down the ROI computation time to <1min. Can you please suggest how can I do it? Tried this python code and it works. However, how to tune parameters by myself on my image dataset? Rather than using the default parameters provided by OpenCV. Already searched but nothing useful found. Hope somebody see this comment could help me. You can choose your parameters by passing them to functions switchToSelectiveSearchFast and switchToSelectiveSearchQuality on line 46 and 50 respectively in C++ code. Then how about OpenCV Python library? It’s similar. The documentation pages I linked to, have syntax for Python too. I guess the output of Opencv implementation doesn’t give an ordered region proposals in terms of objectiveness. It’s totally random. And also the segmentation part has some randomness. Only if you trained the selective search for specific purpose you can get an ordered region proposals.